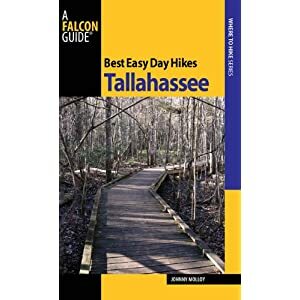 With this book in hand and willing feet you can explore the greater Tallahassee region. No matter where you go, the trails in this book will enhance your outdoor experience and leave you appreciating the natural splendors of the Big Bend. The clear spring emerged from a hidden vent, then quietly flowed through the refuge to the Gulf. I sat on a bench, watching trees sway in the water’s reflection. Shepherd Spring was but one of many gorgeous destinations in this book. I mentally reflected on other destinations, recounting all the scenic hikes of greater Tallahassee and the Big Bend. Within Saint Mark’s National Wildlife Refuge one hike circumnavigated a wildlife rich pond while availing extensive views. Another refuge hike, an interpretive trail, was an outdoor educational experience, with salt marshes panoramas as an added bonus. To the west, two sections of the Florida National Scenic Trail showcased the Apalachicola National Forest. One hike explored Bradwell Bay Wilderness, a place of stark and stunning scenery, while the other traversed the Sopchoppy River valley, where the blackwater stream centered a biologically rich array of flora and fauna. Other national forest trails roamed through geologically fascinating Leon Sinks, where Hammock Sink revealed topaz blue water, and Dismal Sink dripped deep, and the Gopher hole formed a hillside cave, and a boardwalk bisected the heart of a gum swamp. Yet another hike circled forest lakes. Lake Talquin State Forest had its own jewels. The Fort Braden Tract presented two loops that explored hilly terrain cut by swift sand-bottomed streams and along the shore of picturesque Lake Talquin. Nature’s splendor and outdoor learning combined again at Bear Creek Educational Forest, with its Talking Trees Interpretive Trail, swamp forest and deep ravines adding to the multiplicity of ecosystems. Suburban Tallahassee availed its own destinations. San Luis Park had numerous loops that laced the hilly and deeply forested park. Phipps Park had superbly laid out hiker-only trails that traversed bottomland hardwood forests, piney hills, and live oak hammocks. A pair of trails explored the forests and waters through greater Maclay Gardens, demonstrating the ever-changing Florida mosaic of eye-appealing scenery. Tom Brown and Lafayette Parks had nature trails enjoyed by hikers and joggers.